I noticed that some people mention rare/interesting things things they see. I think that others out there might want to share but not make a short topic(like myself...) So i made this! Well I'll get this started. Today, i went to berea after going to train day at a park. The only reason i stayed 3 hours was the CSX mainline bridge. Nothing special, BNSF coal and CSX intermodel and mixed freight trains. I liked the Triplex in G scale someone brought. Anyway, It was around 2:30 when we left and got their around 3ish. 4 other cars were their and their was 2 common comers other than myself. It was a nice day out. about 2 hours later, I was walking towards the coach when my dad yells"Hey! you might wanna tape this! I looked and saw a N.S. auto, curious and confused i looked down the CSX line and saw a diesel that looked black. I backed up and taped the N.S. train. Then the CSX diesel came it was a grey CSX GP-40 with blue lettering! behind was a modified white box car with an American flag paint job with workers. Next a modified tanker spraying something. It smelled and not good(like sour milk)! Then a few more black tankers rolled by.i guessed it was a weed killer train. I loved it! It slowed down and I left around 5:00. Their are many more rare things i would like to share but i will type them later. Let's here some of yours! It would have been neat to see them spraying weeds, but I am afraid the moment I saw them spraying, I would have been running as fast as my legs would carry me, away from the track. I am something of a chicken when it comes to dangerous chemicals. Did you notice if any of the workers were wearing masks and possibly decontamination suits? Or were they all safely inside the work car, working the nozzles by remote control? Without knowing exactly what they were spraying, it would be hard to say exactly how dangerous the chemicals might be. A quick check would be to see if you glow in the dark or if any body parts have fallen off. No they were not wearing mask and they were all crowding the open passage way to get in and out. I saw about 2 people that looked like they were doing some work. It probably was your average weed killer. it sprayed about 1 foot away from the ballast. so you should be fine. I see and hear about track inspections and chain gangs going by in the area but I only get to see these guys usually 1 out of ten. And to answer the rest of the questions so far... The workers were wearing T- shirts either orange or white. Well I don't see any glowing and unless I lost a kidney or something I'm fine. Just another tiring Sunday but it's Father's day! I probably will watch some of my videos with him(the good ones steam days at the C.V.S.R.,Soo line appearances,etc.) and the printer ink is low so i tried printing out a homemade and it looked horrible! Don't worry i used to draw them so hope he likes it! NOTE: I thought of this last night...how about i share one of my stories 1 every week and i got like 8-10 left and their is even more if I see something rare or interesting. Remember i want to hear from YOU too. i really don't exaggerate or anything like that so try to do the same. It could be from a race, a rare road name, special cargo(army, other Locomotives, loco parts,etc.) rare engines(slugs for example.) and any other things that go with railfanning. An MBTA Bilevel in transit on the rear of a CSX freight. A Maine Eastern FL9 in transit behind the power on Guilford. back in the early 1990s, it was still possible to park your car at horseshoe curve, walk the steps, get around the end of the fence and make your way to the ledges at either end of the curve. those were by far the best photo spots. I went their last summer! it was totally different than berea! I did not get any racing but i did get to see some extreme smoke shows....on tape! 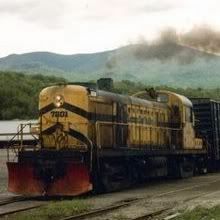 I never seen back engines on main line freight at the time in person but I would never forget. My favorite spot was actually the 2 tunnels! I loved when a superduty coal came! 4 back engines making a alco impreesion! You could see the smoke coming out of the tunnel for a bit of time! Thanks for sharing. that is some great catchings! If any of that passed through Berea, someone would know! (I'm a local but i rarly know anyone their,just chat) I have no scanner....yet . I will try hard to get the circus train this year. I like to E-mail other railfanners to get help. I would love to see those! The CN mainline runs through Edmonton. Quite often a loaded train that runs through is pulled by 4 engines . The train is headed to the western coastline and Vancouver. To get through the mountains it needs four locos. bnsf has a fleet of sd39s that they inherited from the santa fe. i think they are just starting to retire them now. One of the neatest things I've done is to follow the route of the old Transcontinental Railroad (as much as possible) from Omaha to Sacremento. Lots of two lane blacktop, gravel and dirt roads to try to stay close to the route. This isn't very rare, but it was a first for me. I live in a slight valley with trees and mountains all around. When i drove accross the country, I got to see some of the flat land if the mid-west. When I visited Dyersville, Iowa, where I saw the baseball where they filmed Field of Dreams, me, my father, and my brother decided to see some of the local railroads. We followed the line that cut through the town into where there mas nothing but the open fields frim farms. We rode north, up a road that paralleled the tracks. The tracks were elevated on a mound above the the level of the road. At one point, the road went under the tracks and crossed to the other side. When dusk was approaching and the sun fell behind the horizon, we decided we had gone far enough, we hadn't seen anything. It was then we saw a light from in the distance. We qickly turned around because this train was booking it. When the train got to us, we sped up to match its speed at abput 55-60 mph. It was incredible. We oped the windows and let the roaring from the two Canadian CN locomotives enter the car. The best part was crossing right under the engines under the bridge. We chased the train into town and watched it go on into the distance at a crossing. The chase was 20 minutes, and was the best chase of my life. I love doing that! My grandpa calls people who do that foamers. I do it with my dad for many things like Steam day's(that might be next weeks story from me), day out with Thomas and plenty of N.S. diesels on the high way! I do allow that and that is interesting! Thanks for sharing. The Black Hills Central in South Dakota is a good place to chase the train. It crosses over the road at a few places so you can take pics, drive across and ahead of it, take pics, and do it all again.